What would you do if you won the lottery? Or, perhaps, the question should be what wouldn’t you do? When Gregory Tomasov wins, what he does is pack-in his job, pack up his family, leave California, and head for pastures new. Gregory has become disenchanted with his life and his lifestyle. 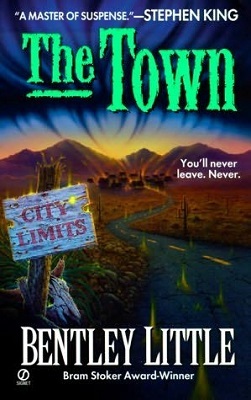 He finds big town life too materialistic and, of course, big towns can be dangerous places. Seeking a better place to rear his children he heads back to the idyllic small town of McGuane, where he grew up. As well as his wife and children, Gregory also takes his mother with him. Much to his mother’s consternation, the one person that he forgets to invite is the ‘Owner of the House,’ Jedushka Di Muvedushka. According to Gregory’s mother’s Molokan beliefs, Jedushka is a protective spirit that acts as a guardian for the home and family and, every time a move is made, the little man must be invited. You might not be surprised to find that Gregory’s oversight is a mistake they all come to regret. This is a novel of two names. In the UK, it’s called The Town. In the USA, it is called Guests. But a rose by any other name, is still a rose; and I have got to say that I like this rose’s thorns. It is one hell of a good read. The characters are believable and well developed, and it is hard not to like them, but the things that happen to some of them are nothing short of tragic.